information about the sites, their historical context and national/international significance. The Heritage Trail is two miles (three kilometres) in length and takes 1.5 - 2 hours, not allowing for stops for refreshments. The Trail can be followed from any starting point and in clockwise or anti-clockwise senses. It can also be truncated if time available is too short to follow the full trail. 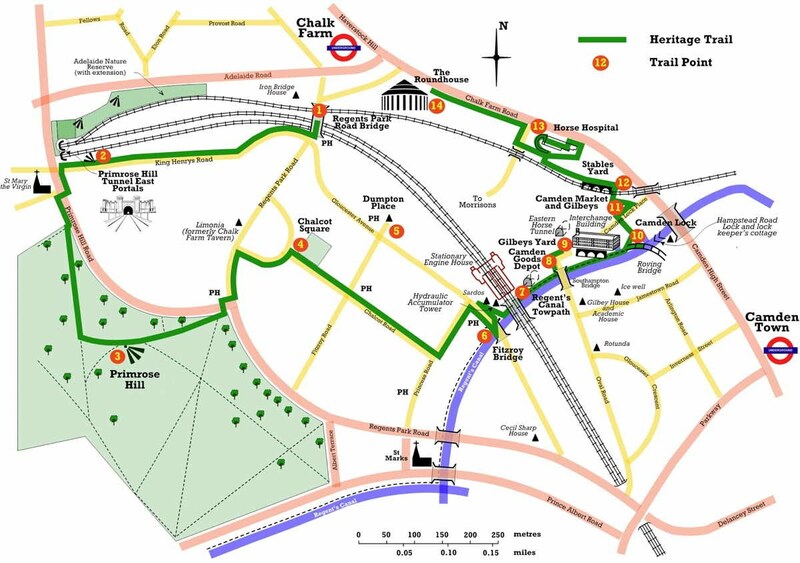 Chalk Farm underground station (see TFL Journeyplanner for travel directions) is a good start and end point for the Trail. The walk can be rounded off by a stop at Marine Ices where the best Italian ice cream in North London has been sold for 70 years, a stone’s throw from the underground station. With Camden Lock and Stables Market on the route, the Trail not only offers a heritage experience but also traverses some of London’s most vibrant attractions. It links with open spaces, the Zoo, the Regent’s Canal, and the many shops, pubs, cafés and restaurants in the area. The Trust has been leading guided walks over the Trail since 2007, arranged both at the request of other groups and on its own initiative. Details of guided walks open to any member of the public are given on the News and Events page. The Trust has also published a 24 page illustrated Trail Guide with a pull-out map that can be purchased online. For multiple orders, please contact the secretary. The Trail represents a major potential educational resource for school history projects, linking classroom study with fieldwork.